Note: green onions are also known as scallions and spring onions. 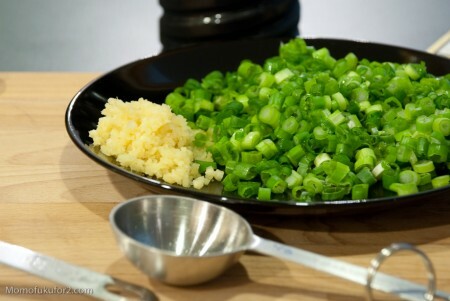 I find that cooking green onions changes the flavour immensely. 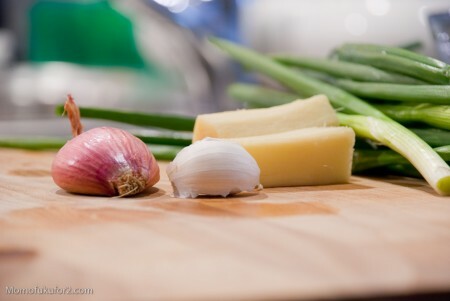 Heat and oil mellows out the onions causing them to become much more aromatic and fragrant, just like how regular raw onions have a distinctly different taste than cooked ones. 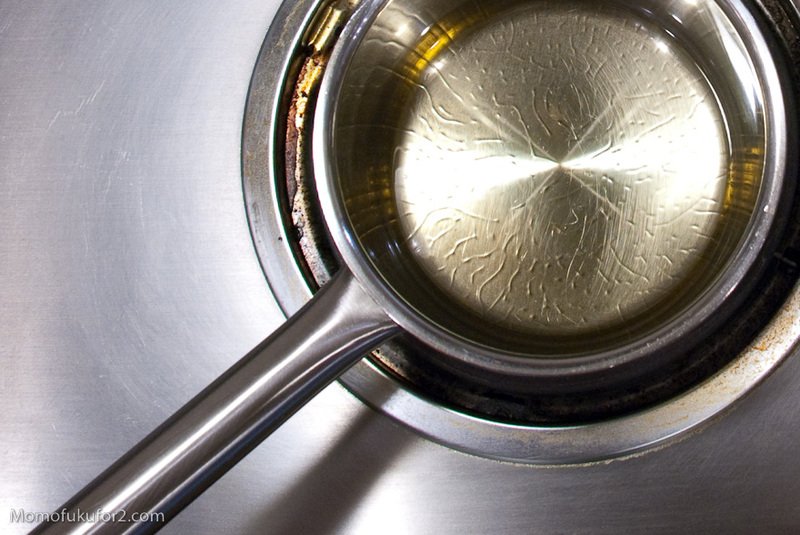 Heat up the grapeseed oil in a saucepan over high heat until the oil is shimmery and hot, but not smoking. 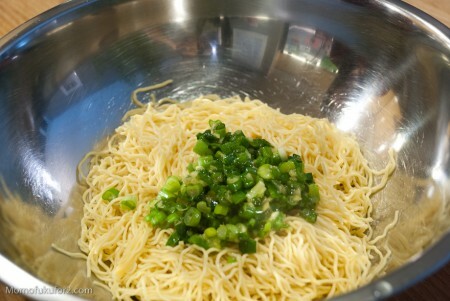 Add the green onions, ginger, garlic and shallots at once, but be careful, the oil will bubble and splatter. The onions will sizzle and wilt almost immediately and turn a bright green. Take the pan off the heat and stir the sauce with a wooden spoon. Add a splash of sesame seed oil and salt to taste. 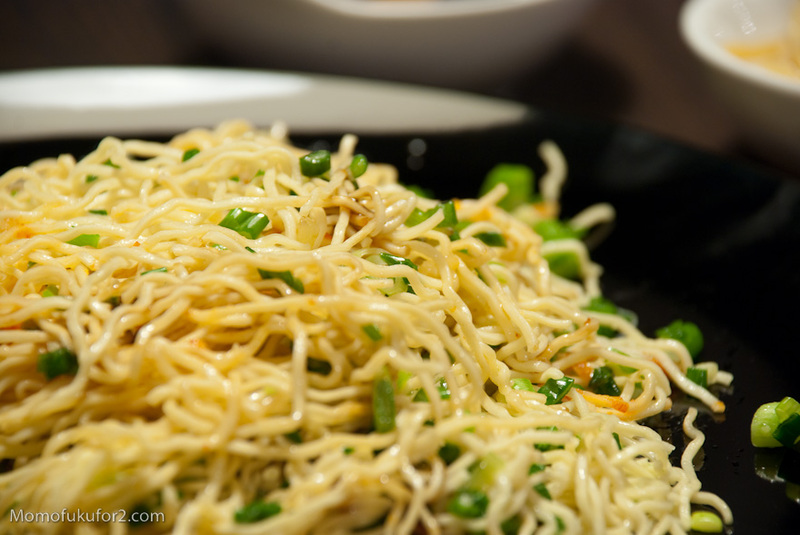 Toss with your favourite noodles, hoisin and sriracha. The green onion oil will keep in the fridge for a couple of days, but it’ll lose that vibrant green colour. My favourite use for it? 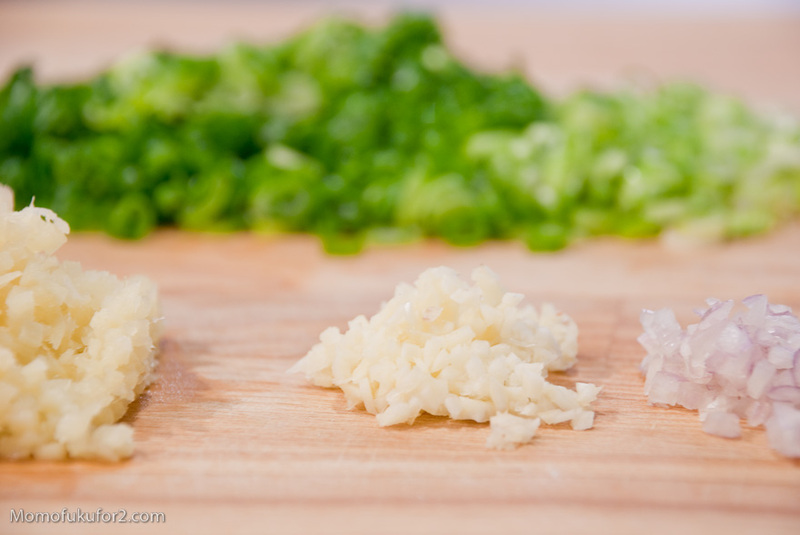 Hainanese chicken rice. But that’s another post. 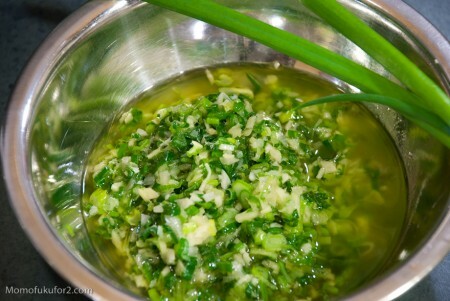 Update: I created my own green onion oil/ginger scallion sauce recipe! 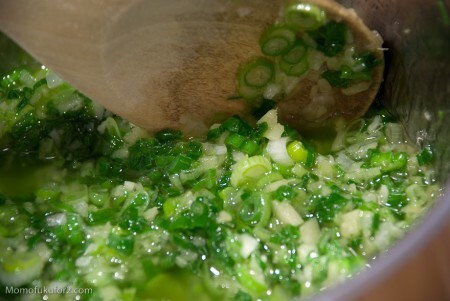 The Ginger Scallion Sauce is very likely the easiest recipe in the book, but maybe I’m getting too into Momofuku’s multi-step recipes because I was a bit disappointed. The sauce was lacking flavour and had too much of a raw taste. I’ve actually had the ginger scallion sauce with the Momofuku fried chicken and it tasted distinctly different. I didn’t wait the requisite 15-20 minutes for the sauce to rest, so that could possibly be the reason why the flavours didn’t meld and the onions tasted so raw. Looking my version of the sauce and a photo of the Momofuku sauce, I can see that they look pretty different. 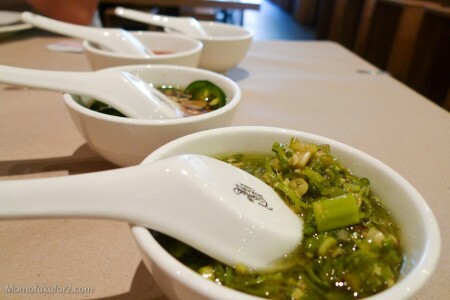 The Momofuku sauce has more oil and is a bit more brown, maybe due to more soy sauce. 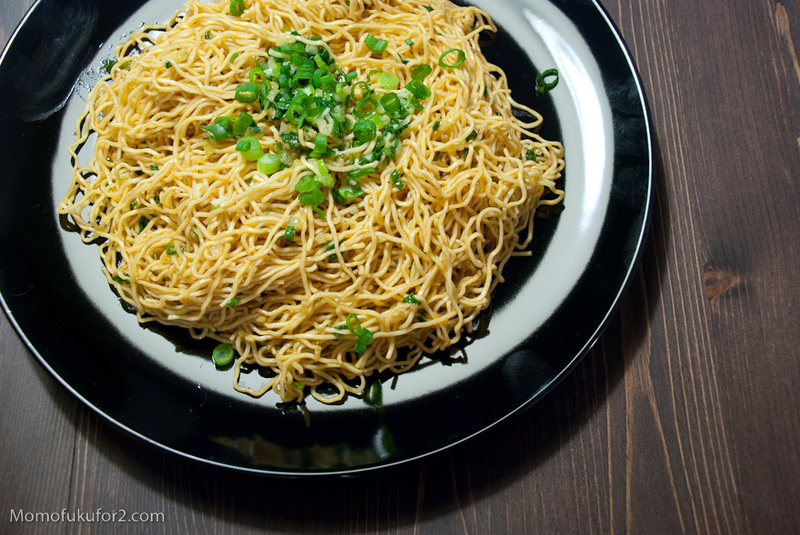 I remember the sauce being addictive when I was eating it so I was really looking forward to having it tossed with noodles, but it just wasn’t what I was expecting. 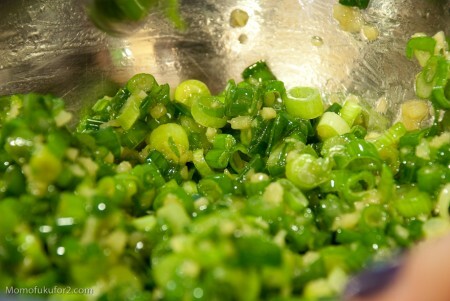 Scallions, ginger, oil, soy sauce, sherry vinegar and salt are stirred together. The ratio of scallion to ginger to oil is about 10:2:1. The sauce gets better as you let it sit, so while you’re waiting, you can prepare your noodle toppings. 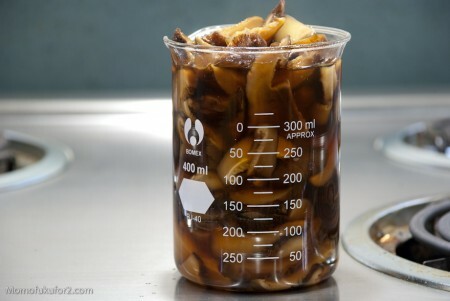 I did quick-picked cucumbers, bamboo shoots and soy sauce pickled mushrooms. The sauce tossed with noodles was delicious, but it was lacking something. Hoisin sauce? Chang does say that you can add it, so I did, and it was better. Mike topped his with sriracha and that made it taste even better, but there was still something missing. 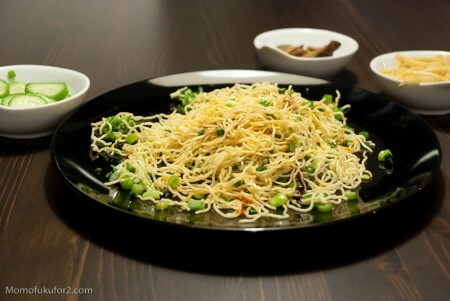 It’s a bold statment to say “ginger scallion sauce is one of the greatest sauces or condiments ever.” And maybe if I was eating Chang-made sauce I would agree, but for me, I think this recipe needs some tweaking for it one of my favourite sauces. The Momofuku name is a registered trademark of Momofuku and David Chang. I'm just using it (fair use?) to refer to his restaurant and cookbook. All original content and photos is © 2010 copyright & all rights reserved Stephanie Le. 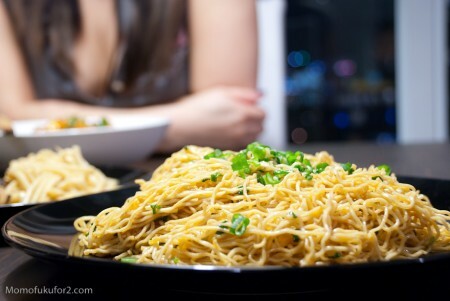 momofukufor2.com is where I document the little tips and tricks I learned while cooking through the Momofuku Cookbook by David Chang and Peter Meehan.